October 2011, fast approaching, is the release month for my upcoming Dust-to-Digital box set, Opika Pende: Africa at 78rpm (October 25th, to be precise), therefore it’s high time for a stone rarity of an African record. For some readers, the artist and title of this track might ring a bell. Part 2 of this terrific, historically significant disc appeared on the Secret Museum of Mankind’s East Africa CD. I thought I’d offer Part 1 from my own copy, completing the listening experience. This 78 represents one of the very first pieces of recorded music from the Zanzibar archipelago, produced during the very first recording sessions of Zanzibari musicians. In March 1928, the Gramophone Company in England shipped a handful of Zanzibari musicians to Bombay, India, including Maalim Shaban and the renowned Siti binti Saad. The engineer was Robert Edward Beckett, who had been recording around the world for GramCo since 1922. Over the next three years, these and other Zanzibari musicians recorded over 125 discs in Bombay, over several visits. The records themselves were pressed in Calcutta, and shipped to Swahili-speaking regions of coastal Africa. Details are scant with regard to precisely when this disc was recorded, but it appears to have been released in September of 1929. After these historic sessions, there seemed to be a mad rush to record East African musicians: Odeon began recording local music all down the East African coast, Pathé shipped East African musicians to Marseille to record, and Columbia began recording some of the very same musicians that GramCo had recorded, except onsite. 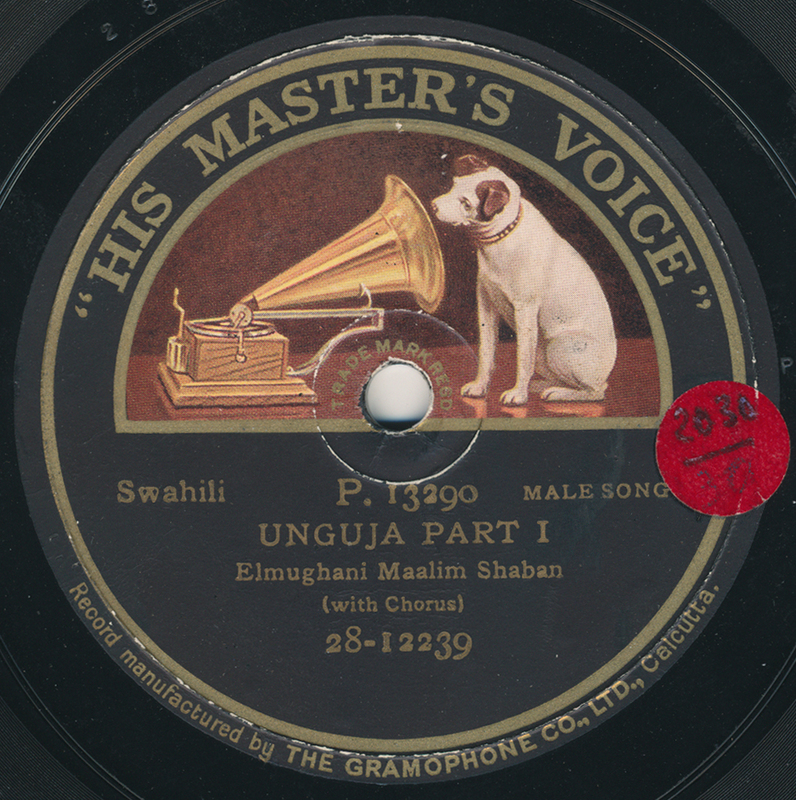 78rpm records and gramophone players, however, had been available in the region for decades, but by and large the music that was being sold to locals was not popular or traditional music in Swahili or other African dialects. It was either English or Indian music – sold to those populations. The Zanzibari music that was recorded in 1928 (and onward) by the Gramophone Company was taarab. Probably the most overt influence heard in early taarab ensembles is the classical Arabic influence. But as scholar Werner Graebner and others have pointed out, the influences were wide – from India and Southeast Asia, to the Persian Gulf’s khaleeji music. The instrumentation heard on this piece is oud, violin, and percussion (darabukka). The title of the piece, “Unguja,” refers to Zanzibar itself (it’s the name of the largest and most populated island of the Zanzibar archipelago). Maalim Shaban lived at least until the 1960s, when he participated in interviews for a book on early Swahili recording artists (Waimbaji wa juzi, by A. A. Jahadhmy, available only in Swahili). For further listening, additional compositions by Maalim Shaban are on Janet Topp Fargion’s essential CD Poetry and Languid Charm, on Topic. For those who don’t follow the Excavated Shellac Facebook page, I was recently on Jason Sigal’s WFMU radio program Talk’s Cheap. He graciously had me for 90 minutes to play music and chat. For those interested, here is a link to the archived show. And as for Opika Pende – I’ll try to keep the self-promotion bearable, but I do hope that any fan of the site, especially those that understand and appreciate the time and effort it takes to find and make these types of recordings available, will purchase and enjoy the set. This was a labor of love – from me, to you. Wonderful stuff Jon! Beautifully done. I do wonder though about identities here – the most prominent singer on this record is, as far as I can tell, quite clearly a woman, of course in all probability the renowned Siti Binti Saad herself, while the male voice component of the chorus, presumably Elmughani Maalim Shaban, the composer and putative main performer according to the label, is here more of a back-up singer in fact! On other Siti Binti Saad discs where she is given as main performer, the same combinations are to be heard, in fact with various voices often coming and going on pretty equal footing, as though there in fact were no “main artist” concept in the studio, an example perhaps of the communality of so much of the music of the continent? Thanks, Tony! You know – I was thinking the VERY same thought as I put this together. Siti binti Saad, perhaps? However, I wanted to err on the side of caution and see what others thought…it does say “male song” and of course Shaban could have been a high tenor. But it would be great to clear this up, for sure. Here we have yet another remarkable piece of music and, again, one that I was not familar with before. This piece is another reminder of how the early electrical recordings often capture, not only the essence of the music performed, but also the ambience of the recording room. The character of all the instruments is put forward exquisitely and one can’t help put think how many modern recordings are rendered unlistenable in the future due to the use of at-the-time fashionable production methods. The interplay of percussion, violin and lead vocals, combined with the chorus, is nothing short of captivating. I’ll do a bit of promoting on your behalf. I’ve put in an advance order for “Opaka pinde” through Amazon and got the set for 50 euros, shipping included. Considering the quality of recordings you’ve put available to us all and the amount of research you regularily invest in the music, it seemed like a bargain to me. “Excavated Shellac – Strings” is one of the best anthologies issued at any time, anywhere. I expect “Opaka pinde” to be of similar quality. Thanks so much for your kind comments – I really appreciate them. I agree – the ambient sound embedded in certain recordings is often completely fascinating – in fact, I wanted to do a short podcast about that very subject. The only thing that’s holding me back is time! And I sincerely hope you enjoy OP – we put a lot of time and effort into the project. I have been a regular on this blog for some time, though this is my first official interaction. I want to sincerely thank you for making such precious music and information available to those with the ears to listen. I also wanted to tell you personally that I pre-ordered Opika Pende from Dust to Digital, and have already received it! It is indeed a thing of beauty, and quite eye-opening (even to a guy who has tons of vintage African music on CD). It’s clear that it was a labour of love, and I really appreciate you making these rare recordings available. Hopefully this is a harbinger of things to come; I know that I for one would be the first in line to buy more vintage world music on CD from people such as yourself and the good folks at Dust to Digital! Thanks a lot, Josh, for the generous comments – I’m really glad you’re enjoying the set! Jon, thanks so much for keeping the blog going. Great interview on WFMU as well. Looking foward to the new release. I think I was away when you posted this – anyway, I’ve just caught up with it, and very glad to see you still posting such wonderful music (and beautiful labels!). Can’t offer any contribution to the identity debate, I’m afraid, but thanks, as ever. Got the box set in the mail last week from DTD—beautifully done, looking fwd to getting to know it over the next few months. Thanks! I’m currently listening to the WFMU radio program and would like to have more information about the third Indian track you played. Could you give me the exact name of the artist ? This song is amazing, it makes me think of the wild way Ethiopian saxophonist Getatchew Mekurya plays the saxophone (“Ethiopiques” sampler vol.14). Anyway many thanks for this show and for all these treasuries you post on Excavated Shellac ! Greetings – Sorry for the delayed response. I am betting that by now you found the link to the playlist for the show, which has the artist/song titles, etc. OK i get it now ! Thank you for introducing us to this “T.N. Rajarathinam Pillai”, I don’t know if you agree with this parallel with Getatchew Mekurya and his very special “Shellela” saxophone style, there is something in common according to me. I just want to say I took a chance and bought Opika Pende based on previous love for Dust-To-Digital. I am very happy to have it and am enjoying it very much. thank you! Thank you very much, Quinn!